Providing a sophisticated kick of caffeine just as handily in the backwoods as in the break room, Nomad's a portable, tissue box-sized espresso machine that requires nothing but a little elbow grease to pull delicious, barista-caliber shots anywhere you want, complete with as much barista-caliber attitude as you're willing to give yourself. 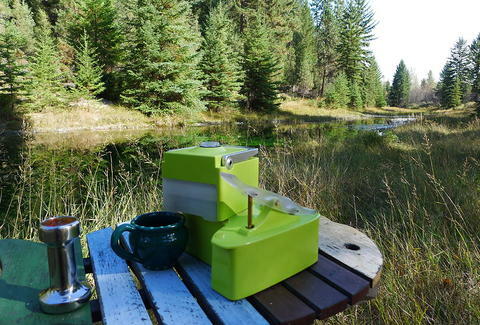 Unlike larger machines found in coffee shops, it requires no electricity, compressed air cartridges, or direct water hookup, and instead works simply by packing a scoop of grounds, adding a little hot H20, and pumping a hand crank a few times. Plus, it's engineered specifically to be lightweight and compact enough to take camping, hunting, on picnics, and, should you be a total weirdo, even business trips.